A pair of international comps went down over the weekend that featured some well-known international stars as well as a few American names. 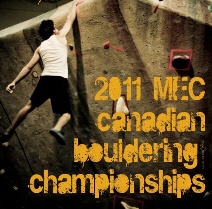 The first comp was the finale of the 8th Tour de Bloc at the 2011 Canadian Bouldering Championships in Burlington, Ontario, Canada. Gripped has a nice writeup as well as some pictures of the event that saw America’s Angie Payne win on the women’s side and Alex David Johnson finish 5th for the men. The second comp took place over in Europe, where the 2011 World Cup bouldering season kicked off with a stop in Milan, Italy. With 2010 overall champ Adam Ondra a bit preoccupied climbing routes that left the door open for Kilian Fischhuber to reclaim the top spot on the podium for the men. For the women it was Jain Kim, who is mostly known for her success on the lead climbing circuit, nabbing the top spot on the podium. Alex Puccio and Alex Johnson, the lone representatives for the U.S. in the comp, finished 6th and 8th respectively. The next bouldering World Cup will be held in Slovenia May 7-8. Here’s a trailer for a documentary that’s coming out about the TBD nationals. oops TDB. Looks like they’ll take a good look at both sides of the competition.